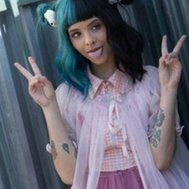 Are u a true Melanie Martinez fan? 1: How many songs have she do? 2: What year are Melanie born? 3: What of this tattoos haven't Melanie? 4: What was her first music video on YouTube? 5: What of this artists HAVEN'T Melanie do a cover to? 6: What is her two favorite colors? 7: How many sisters do she have? 8: How many brothers do she have? 9: What is her Instagram? 10: Are she da best?